Resistell proposes an alternative to the current gold standard in antibiotic susceptibility testing, culture based antibiogram. Our offering is a diagnostic device. The rapid AST method is based on the detection of nano-motion caused by living bacterial cells. Because the test is growth independent, we reduce the time to result from days to minutes. 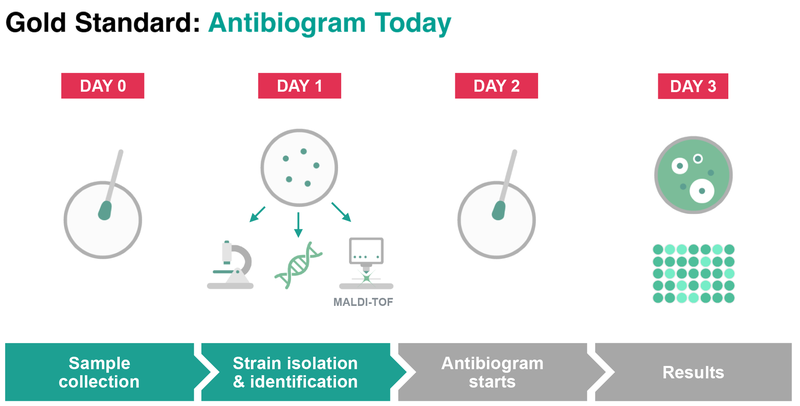 Currently, the antimicrobial susceptibility test, the so called antibiogram, requires growing a culture for 1-2 days in order to to identify the pathogen. The precise timescale depends on the type of bacteria. After this, an additional 12–24 hours are needed to conduct an antibiotic sensitivity screen. In the case of slow growing bacteria, e.g. M. tuberculosis, such a test may take up a full month to complete. Resistell proposes a new, growth independent approach to determining bacterial resistance to antibiotics. Faster diagnosis reduces morbidity, time spent in the hospital and the overall cost of treatment. Contrary to other technologies (e.g. molecular diagnostics) Resistell also provides information, such as what concentration of a specific antibiotic should be used to treat the patient. The customers - hospital laboratories - will buy the product because it generates faster and more accurate results than the current gold standard.